Notes: Labelled this workout EPIC because I was caught in the storm while cycling. I broke my universal adapter so I had to cycle 4 miles to Radioshack to get a new one. 2 Miles before reaching Radioshack, I noticed this huge wall of dust brewing in the distance(picture). It was a dusty storm, complete with uncomfortably frequent lightning. I carried on cycling thinking I could reach RadioShack before it hit me but man, I was wrong. At least I was still plugged into my iPhone and enjoying the soothing acoustic songs of Spotify’s ‘Evening Chill’ music. I must say I was honestly enjoying myself despite being wet and cold, I couldn’t stop grinning to myself like a fool. The dude at RadioShack was kind enough to let me bring my bike into the store because the wind was so strong. It kept blowing the door open which let rain in as well. After purchasing the adaptor, I decided to cycle to the nearby Sprouts grocer to do my grocery shopping since I was already drenched to my underwear. After a mile, the already heavy storm just got worse! 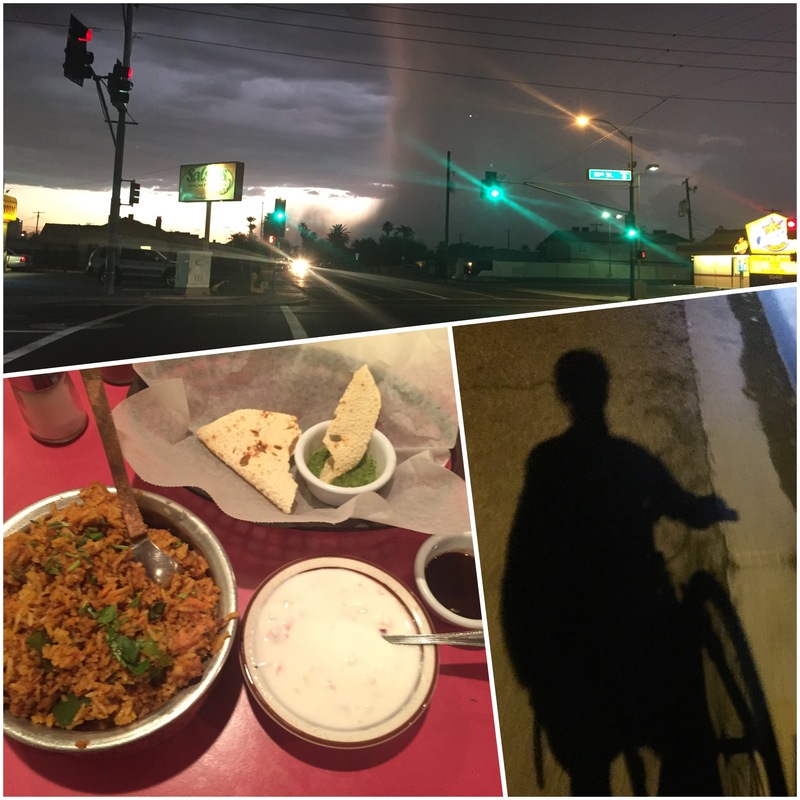 I tried cycling on but started to fear for my life so I sort shelter at the nearest restaurant I could find which was still open. This turned out to be a very hospital place called Flavors of India. Inside, I was warmly greeted and offered to bring my bike in and use the bathroom too. I stripped and squeezed the water out of all my clothes, including my socks and underwear. Following this, I ordered the tastiest Chicken dum Briyani I have ever eaten in my life! It came with a bowl of yogurt to balance the heatiness of the spice. Additionally, there was a delicious complimentary Papadam which was flavored with herbs. The meal was so good but too much for my small stomach so I had the remaining to go and started my journey home. Thankfully, there was no rain on the way back but the wind was humongous! Despite me cycling standing up, I still took more than a second to ‘paddle’ on each side. Lastly, I was completely wet but after cycling in that wind, I dried up! Notes: Haven’t done cables in awhile so I felt like doing this! Cable machines force your stabilizing muscles to work much harder and they allow for more flexibility and range of movements. I got this workout from YouTube (Below). Quite tough since it was mostly learning how to do the exercises with proper form. Had to go light for most of them. I took out one or two exercises because they involved repeative movements. Next Post Make Your Own Salad Lunch!